[ri-ˈsərch, ˈrē-] Scholarly or scientific investigation or inquiry. The diligent and systematic inquiry into a subject in order to discover, interpret or revise facts, theories, etc., in light of new facts, or practical application of information about a particular subject. An inquisitive nature was the impetus for Dr. Steven Chudik’s career as a fellowship trained and board certified orthopaedic surgeon, sports medicine physician and arthroscopic pioneer for shoulder and knee injuries. It also led him to design and patent special arthroscopic surgical procedures and instruments, and create the Orthopaedic Surgery and Sports Medicine Teaching and Research Foundation (OTRF). Through OTRF, Dr. Chudik conducts unbiased orthopaedic research and provides up-to-date medical information to help prevent sports injuries. He also shares his expertise and passion mentoring medical students in an honors research program, and serve as a consultant and advisor for other orthopaedic physicians and industry research. To evaluate and improve patient care, Dr. Steven Chudik conducts independent clinical outcomes research. It is important to track our patients’ short-term, as well as long-term, outcomes, and put our treatments to the test. Through critical analysis of our results, we learn about the limits of current treatment standards and push ourselves to discover better alternatives for our patients. See Areas of Research and Development. To better understand the basic science of anatomy, tissue injury and healing, injury mechanisms and prevention, implant and fixation biomechanics, joint tribology and other orthopaedic and sports medicine basic science, Dr. Steven Chudik collaborates with Loyola University of Chicago, Hines V.A. Musculoskeletal Biomechanics Center, Argonne National Laboratory, and multiple other partners in industry. Exploring hypotheses in the laboratory broadens our basic orthopaedic knowledge and helps Dr Chudik extrapolate and bring new ideas into patient care. There have been many innovations in patient care that were first discovered in the laboratory. See Areas of Research and Development. Dr. Steven Chudik continually innovates to create new technology, surgical techniques and improve patient care. He also collaborates worldwide with other leaders in the orthopaedic technology industry. Surgeries provide Dr. Chudik with an endless source of ideas to create new, safer, less invasive, and more effective surgical procedures, surgical instruments and implants. Several of his patent works are the direct result of these pioneering endeavors. See Areas of Research and Development. Minimally Invasive Shoulder Replacement, Techniques, Instruments and Methods. Principal investigator. Goals of this project are to develop and research the MIS shoulder. Research includes basic science studies (anatomical, technical, and biomechanical) and clinical outcome studies to evaluate safety and effectiveness. Safety and Anatomic Landmarks for a New Arthroscopic Transhumeral Portal. Steven Chudik, MD, Kimberly Bartosiak, Loyola University of Chicago, Stritch School of Medicine STAR Program, October 8, 2014. Arthroscopic Rotator Cuff Repair Using Transosseous Suture-Needle System. Principle investigator. Goals of this project are to develop and research this transosseous rotator cuff repair system. Research includes basic science studies (anatomical, technical, and biomechanical) and clinical outcome studies to evaluate the safety and effectiveness. Currently, performing technical pilot studies on cadaver specimens. The Prospective Evaluation of Arthroscopic Rotator Cuff Repair using Suture Anchors and Intra-Articular Knot Tying Techniques for Patients with Full Thickness Rotator Cuff Tears. Co-investigator. Goal is to obtain prospective outcome data for a large group patients undergoing arthroscopic rotator cuff repair. Collected 350 + patients and are collecting data for the two-year follow up (2-, 5-, and 10-year follow up). Funding level: $500,000 +. Arthroscopic Double-Row Rotator Cuff Repair: A Comparison of Methods Using a Parachute Tissue Anchor Versus a Threaded Double-Loaded Suture Anchor. Snyder J, Master D, Obopilwe E, Mazzocca AD, Chudik SC. 19TH Congress of the European Society for Surgery of the Shoulder and Elbow (ESSSE), Rome, Italy, September 21-24, 2005. Arthroscopic Double-Row Rotator Cuff Repair: A Comparison of Methods Using a Parachute Tissue Anchor Versus a Threaded Double-Loaded Suture Anchor. Snyder J, Master D, Obopilwe E, Mazzocca AD, Chudik SC. American Academy of Orthopaedic Surgeons Annual Meeting, Chicago, IL, March 22-26, 2006. Arthroscopic Double-Row Rotator Cuff Repair: A Comparison of Methods Using a Parachute Tissue Anchor Versus a Threaded Double-Loaded Suture Anchor. Snyder J, Master D, Obopilwe E, Mazzocca AD, Chudik SC. Arthroscopy Association of North America Annual Meeting, Hollywood, FL, May 18-21, 2006. Arthroscopic Rotator Cuff Repair With Biceps Tendon Augmentation. Nassos J, Chudik S. American Journal of Orthopaedics 2009; 181-183. Methods of Arthroscopic Bony Bankart Repair and Reconstruction. Principle investigator. Goals of this project are to develop and research this method and system of bony Bankart repair and reconstruction. Research includes basic science studies (anatomical, technical, and biomechanical) and clinical outcome studies to evaluate the safety and effectiveness. The Prospective Evaluation of Arthroscopic Anterior Shoulder Stabilization using Suture Anchors and Intra-Articular Knot Tying Techniques for Patients with Traumatic Anterior Shoulder Instability. Co-investigator. Goal is to obtain prospective outcome data for a large group of patients undergoing arthroscopic bankart repair. We collected 250+ patients and are collecting data for the two-year follow up (2-, 5-, and 10-year follow up). Funding level: $500,000 +. Arthroscopic Glenoid Reconstruction (Bony Bankart). Steven C. Chudik, MD, Gregory Barton, Brittany Kaim DeGreef, David Suprenant,. The 2014 annual meeting of the American Academy of Orthopaedic Surgeons, New Orleans, Louisiana, March 11-15, 2014. A Lower Anteromedial Portal Safety Assessment to Arthroscopically Repair Anterior Osseous Bankart Lesions. Steven Chudik, MD, David Suprenant, Loyola University of Chicago, Stritch School of Medicine STAR Program, October 16, 2013. Methods of Acromioclavicular Joint Repair. Principle investigator. Goals of this project are to develop and research this method and system of AC joint repair. Research includes basic science studies (anatomical, technical and biomechanical) and clinical outcome studies to evaluate the safety and effectiveness. Plate Fixation for Proximal Humerus Fractures A New Technique and Biomechanical Study. Chudik SC, Weinhold P, Dahners LE. Percutaneous. Poster Presentation. Orthopaedic Research Society Annual Meeting, San Francisco, CA, February 2001. Fixed-Angle Plate Fixation in Simulated Fractures of the Proximal Humerus: A Biomechanical Study of a New Device. Chudik SC, Weinhold P, Dahners LE. Journal of Shoulder Elbow Surgery 2003;12(6):578-588. Clavicle Fixation; Locking vs. Non-Locking Screws. Steven Chudik, MD, Mark Lorenz, MD, Brian Sleasman, Loyola University of Chicago, Stritch School of Medicine STAR Program, October 16, 2013. Assessment of Patient Outcomes After Mid-Shaft Clavicle Fixation Procedures Performed with Either Two or Three Screws on Each Side of the Plate. Steven Chudik, MD, Christopher Larsen, Loyola University of Chicago, Stritch School of Medicine STAR Program, October 8, 2014. Investigation of Exparel® , a Slow-Release Liposomal Form of Bupivacaine as an Alternative to Interscalene Block for Superior Post-Operative Pain Management. Steven Chudik, MD, Christopher Larsen, Loyola University of Chicago, Stritch School of Medicine STAR Program, September 29, 2014. A National Survey of Youth Baseball Pitchers Regarding Pitching Exposure and Elbow and Shoulder Problems. Steven C. Chudik, MD, Kevin Casey, Loyola University Chicago, Stritch School of Medicine STAR Program, November 6, 2010. Isolated Tear of the Annular Ligament in a 14-Year-Old Athlete: A Case Report. Martin S, Evans D, Chudik S, Loyola University Chicago, Department of Orthopaedic Surgery and Rehabilitation Journal 2008; Vol 27: 69-71. Methods of ACL Reconstruction. Principal investigator. Goals of this project are to develop and research this method and system of ACL revisions. Research includes basic science studies (anatomical, technical, and biomechanical) and clinical outcome studies to evaluate the safety and effectiveness. Methods of ACL Reconstruction in Skeletally Immature Individuals. Principal investigator. Goals of this project are to develop and research this method and system of ACL reconstruction. Research includes basic science studies (anatomical, technical, and biomechanical) and clinical outcome studies to evaluate the safety and effectiveness. Altered Tibiofemoral Motion and ACL Strain Patterns During Early Knee Flexion Against a Simulated Eccentric Quadriceps Contraction: Evidence for a Compression-Flexion-Rolling Theory Mechanism for the Non-Contact ACL Injury. Principal Investigator, Musculoskeletal Biomechanics Laboratory at Loyola Medical Center, Chicago. Anatomical Characterization of the Distal Femoral and Proximal Tibial Epiphysis in the Skeletally Immature Individual using Magnetic Resonance Imaging Techniques. Co-investigator. Goal of the project is to describe the proximal tibia and distal femur epiphyseal and physeal anatomy, and evaluate the technical capability of safely drilling epiphyseal tunnels for ACL reconstruction for different age male and female skeletally immature individuals. Funding level: $10,000. Methods of ACL Reconstruction. Principal investigator. Goals of this project are to develop and research this method and system of ACL reconstruction. Research includes basic science studies (anatomical, technical, and biomechanical) and clinical outcome studies to evaluate safety and effectiveness. Methods of ACL Reconstruction in Skeletally Immature Individuals. Principal investigator. Goals of this project are to develop and research this method and system of ACL reconstruction. Research includes basic science studies (anatomical, technical and biomechanical), and clinical outcome studies to evaluate safety and effectiveness. All-Epiphyseal Physeal-Sparing Anterior Cruciate Ligament Reconstructive Surgery: A Study of Three Dimensional Modeling to Characterize a Safe and Reproducible Surgical Approach. Steven C. Chudik, MD, Daniel A. Marchwiany, Michael Ryan Richard Lawley, Loyola University Chicago, Stritch School of Medicine STAR Program. Altered Tibiofemoral Motion and ACL Strain Patterns During Early Knee Flexion Against a Simulated Eccentric Quadriceps Contraction: Evidence for a Compression-Flexion-Rolling Theory Mechanism for the Non-Contact ACL Injury. Principal investigator, Musculoskeletal Biomechanics Laboratory at Loyola Medical Center. Double Bundle versus Single Bundle ACL Reconstruction in a Dynamic Loading Model. Principal Investigator, Musculoskeletal Biomechanics Laboratory at Loyola Medical Center, Chicago. The Effect of Initial Fixation Method on Bone Plug Incorporation in a Canine Model for Anterior Cruciate Ligament Reconstruction. Fedor E, Chudik S, Plzak L, Federico D, Montag A, Reider B. Presented at the Pritzker School of Medicine Summer Research Poster Forum, University of Chicago, IL, 1993. Biomechanical and Histological Analysis of Graft Fixation in ACL Reconstruction Using an in vitro and in vivo Canine Model. Fedor E, Chudik S, Plzak L, Federico D, Montag A, Reider B.
Anterior Cruciate Ligament Injuries in Women: Diagnosis, Management and Prevention. Chudik SC, Garrett WE. Women’s Health,Orthopedic Edition 2001; 4(3): 100-108. Anterior cruciate Ligament Injury in Children: Update of Current Treatment Options. Beasley LS, Chudik SC. Current Opinion in Pediatrics 2003;15:45-51. Aggressive Quadriceps Loading Can Induce Noncontact Anterior Cruciate Ligament Injury. DeMorat G, Weinhold P, Blackburn T, Chudik S, Garrett W. American Journal Sports Medicine 2004;32:477-483. The Use of an All-Epiphyseal Femoral Tunnel During ACL Reconstruction in a Skeletally Immature Canine Model. Chudik SC, Beasley LS, Potter HG, Rodeo SA, Wickiewicz TL, Warren RF., Orthopaedic Research Society, Baniff, Canada, October 2004. Altered Tibiofemoral Motion and ACL Strain During Knee Flexion. Drew Warnick, MD; Jeremy Goodsitt, Mark Sartori, BS; Josh Snyder, MD; Robert M. Havey, BS; Pietro Tonino, MD; Steven Chudik, MD; Paul Weinhold, MD; Avinash G. Patwardhan, PhD. Against Simulated Eccentric Quadriceps Forces. Loyola Medical Center Research Conference, Loyola University of Chicago, June 2008. Altered Tibiofemoral Motion and ACL Strain During Knee Flexion Against Simulated Eccentric Quadriceps Forces. Drew Warnick, MD; Jeremy Goodsitt, Mark Sartori, BS; Josh Snyder, MD; Robert M. Havey, BS; Pietro Tonino, MD; Steven Chudik, MD; Paul Weinhold, MD; Avinash G. Patwardhan, PhD. Mid-America Orthopaedic Association meeting, 2008. The Influence of Femoral Technique for Graft Placement on Anterior Cruciate Ligament Reconstruction Using a Skeletally Immature Canine Model With a Rapidly Growing Physis. Chudik SC, Beasley LS, Potter HG, Rodeo SA, Wickiewicz TL, Warren RF. Arthroscopy: The Journal of Arthroscopic and Related Surgery, December 2007; Vol. 23, Issue 12, Pages 1309-1319, e-1. The Tribology of Articular Cartilage Against Artificial Joint Surfaces. The goal is to determine which artificial joint surfaces—commercially-available and novel—create the best surface interaction with cartilage. Also investigating, the tribological behavior of native cartilage against different artificial surface materials. Co-investigator in collaboration with Argonne National Laboratory. AANA research grant. The Tribology of Articular Cartilage. Argonne National Laboratory. Investigating Cartilage Injury and its Effect on Tribological Properties and Wear. Tribology of Novel Artificial Focal Joint Surface Replacement Against Cartilag. Pilot funding: $9,336. Artificial Materials for Joint Resurfacing: A Tribological Study of Friction and Wear. Steven C. Chudik, MD, Robert Erck, PhD, Joseph A. Gil, Loyola University Chicago, Stritch School of Medicine STAR Program, November 20, 2009. Reciprocating Friction and Wear Studies of Bovine Cartilage Sliding Against Cartilage, Polyurethane, Polyethylene and Cobalt-Chrome Alloy Discs; Robert Erck, PhD, Oyelayo Ajayi, Joseph A. Gil, Steven C. Chudik; MD; STLE Annual Meeting, Las Vegas, NV, May 16-20, 2010. Joint Resurfacing with Osteochondral Replacement Plugs of Artificial Material: A Tribological Study of Friction and Wear. Neal Mugve, Steven C. Chudik, MD, Robert Erck, PhD. Loyola University Chicago, Stritch School of Medicine STAR Program, November 6, 2010. Reciprocating Friction and Wear Measurements of Bovine Cartilage Sliding Against Cartilage, Polyurethane, Polyethylene, and Cobalt-Chrome Alloy Discs. Joseph A. Gil, Robert Erck, PhD, Steven C. Chudik, MD. The 3rd Combined Meeting of JOSSM/AOSSM, Maui, Hawaii, March 27-29 2011. Management of Chronic Posterior Tibial Subluxation in the Multiple Ligament Injured Knee. Chudik SC, Simonian PT, Wickiewicz T. Fanelli GA, editor. Management of the Multiple Ligament Injured Knee. New York: Springer-Verlag, 2004. Stress and Strain Patterns Surrounding Bone, Tendon, and Soft-Tissue. Co-investigator in collaboration with Argonne National Laboratory. Stress and Strain Patterns Surrounding Bone, Tendons and Soft-Tissue. Co-investigator in collaboration with Argonne National Laboratory. Funding: $8,125. Osteotomy for the Stabilization of Recurrent Post-Traumatic Dislocation of the Hip. Crowther JD, Chudik SC, Dahners LE. Periacetabular Journal of Orthopaedic Trauma 2002;16(6):433-435. Hip Dislocations in Athletes.Chudik SC, Allen AA, Lopez V, Warren RF. Sports Medicine and Arthroscopy and Review 2002;10:123-133. Successful Treatment of a Dislocating Posterior Tibial Tendon. Williams D, Chudik S C, McCasey C, Pinzur M. Loyola University Chicago, Department of Orthopaedic Surgery and Rehabilitation Journal 2008; Vol 27: 30-33. Pre-Operative Video Education has a Positive Impact on Patient Arthroscopic Surgical Experience but May Not Improve Satisfaction Scores. Loyola University of Chicago, Stritch School of Medicine STAR Program, October 16, 2013. Once a month, Dr. Steven Chudik, board certified orthopaedic surgeon, sports medicine physician and founder of the Orthopaedic Surgery and Sports Medicine Teaching and Research Foundation (OTRF), hosts a one-hour sports medicine conference for athletic trainers, physical therapists, orthopaedic clinicians, medical students and physicians. Topics range from discussions about published research to interesting patient cases and radiographic diagnostics. Contact us to learn how you can participate remotely and receive continuing education credits. Keeping individuals active and healthy is at the very core of the Orthopaedic Surgery and Sports Medicine Teaching and Research Foundation’s (OTRF) mission. To support that, ORTF produces Active Bones, an e-newsletter that provides tips on injury prevention, nutrition, sports conditioning and research. The OTRF Athletic Training Residency program is specifically designed to provide the experience athletic trainers need to be able to work in clinical settings. The one-year program immerses athletic trainers in hands-on clinical, surgical and educational experiences that prepares them to make an immediate impact on an orthopaedic practice’s clinical efficiency, patient satisfaction and revenue. For information and an application, go to www.otrfund.org. For athletic trainers already practicing and interested in learning more about working in a clinic setting, Dr. Chudik offers a six-month Career Development Experience (CDE) to work part-time in his orthopaedic sports medicine clinic. For more information about this unique career opportunity, Contact us for more information and an application. 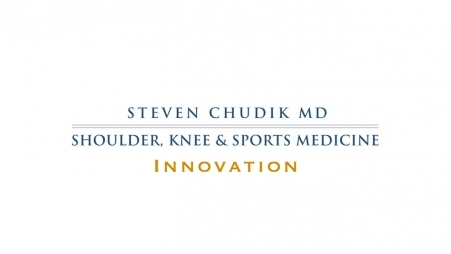 As a Top Doctor in orthopaedics and a pioneer in orthopaedic shoulder and knee arthroscopic surgery, and sports medicine, Dr. Steven Chudik is a noted researcher and clinical assistant professor at Loyola University of Chicago. That educational affiliation enables Dr. Chudik to mentor medical students through the university’s STAR Program (Student Training in Approaches to Research). Each year, Dr. Chudik advises and instructs a select number of honor students on research projects from the beginning brainstorming phase through the submission and publication of their technical papers to professional journals and associations. The SOAR Program, (Students interested in Orthopaedics And Research) is an educational curriculum designed to expose interested and motivated undergraduate and pre-med students to orthopaedic surgery and research. The one-year program, and a ten-week summer rotation, allow participants to explore the fields of clinical practice and medical research under the supervision of Dr. Steven Chudik, founder and president of OTRF and a board-certified orthopaedic surgeon and sports medicine specialist. SOAR participants gain valuable experience to help them make career decisions and support their application to medical school. Get information and an application. Internships, either for a semester or the summer, provide marketing/communications collegians with an opportunity to write and produce e-newsletters, videos, social media campaigns, blogs, feature articles, testimonials, presentations, etc. Contact us for more information about this hands-on educational opportunity.